Speake-Marin expands its dapper One&Two collection with a travel watch combining a dual time indication and a retrograde date. 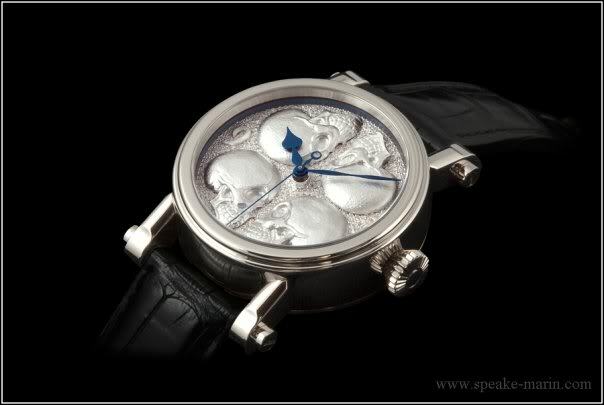 Launched just two years ago, the Speake-Marin One&Two is, without a doubt, one of the most striking developments of the brand. 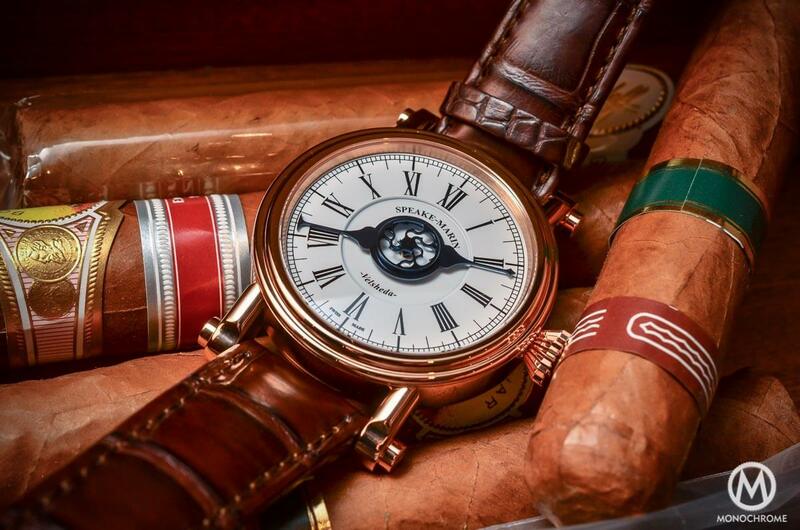 The collection is quintessentially Speake-Marin: an offbeat take on classic Swiss watchmaking infused with a touch of British elegance and eccentricity. Not just a pretty face, the One&Two owes a lot to its movement, a nice micro-rotor calibre with a unique small seconds display at 1:30. 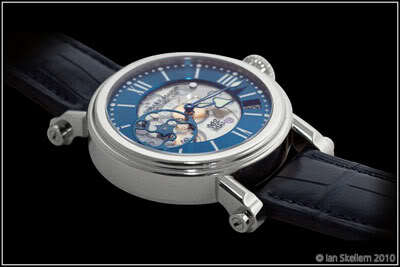 It now welcomes new complications, with the addition of a dual time indication and a retrograde date. The proprietary calibre has been encased in the closed-dial (SMA01) or openworked (SMA02) versions with hours, minutes and seconds indication. 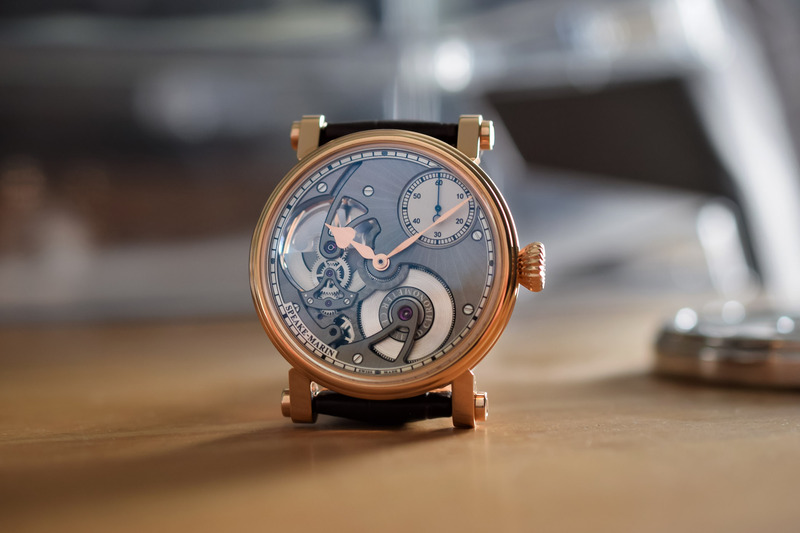 A logical continuation, Speake-Marin uses this movement to keep expanding the collection. The latest addition to the SMA series, the SMA02, integrates a dual time display and a retrograde date. 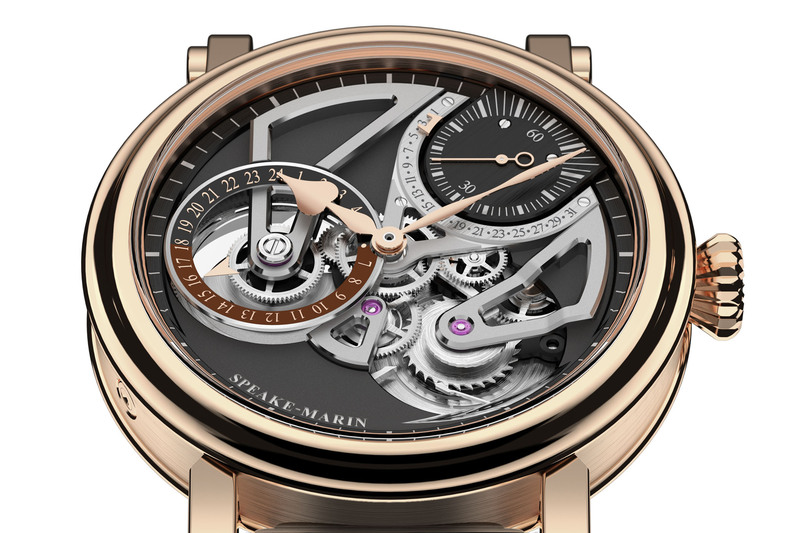 Presented at the SIHH 2019, the Speake-Marin One&Two Openworked Dual Time is a stylish travel watch with a partially skeletonized dial allowing a view of the intricate inner workings. The distinctive openworked bridges feel more angular and technical than in previous versions. The resulting 3D architecture is truly eye-catching with a ‘triangulation’ between the GMT, the small seconds and the barrel. The latter features a cool wolf tooth ratchet wheel. Always a handy addition, the dual time indication displays the home time on a 24-hour scale at 9 o’clock. The two-tone ring lets you determine whether it is day or night at a glance. The retrograde date indication frames the small seconds; it is read thanks to a small indicator travelling along the 31-day scale. It is adjusted via a pusher in the case band. Turning the watch over, the exhibition caseback offers an unimpeded view of the movement and its micro-rotor, integrated under the brand’s hallmark watchmaking topping tool. The SMA02 calibre is beautifully decorated with thin ribbing. From a technical perspective, it runs at 28,800 vibrations per hour and boasts a 52h power reserve. This new calibre is encased in the dynamic and stylish Picadilly case (which was redesigned with Eric Giroud). The colour mix combines gold, brown, silver and black. Just like the previous versions of the One&Two, the Dual Time comes in 38mm or 42mm diameters. 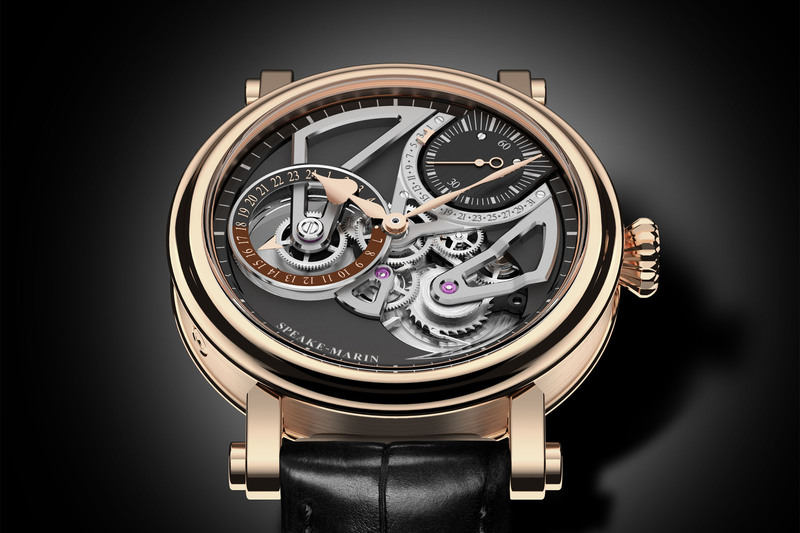 Each version comes in a limited edition of 20 pieces only in pink gold. And, with two sizes options, it will look good on most wrists. The Speake-Marin One&Two Openworked Dual Time comes on a brown alligator or grey crocodile leather strap and gold pin buckle. 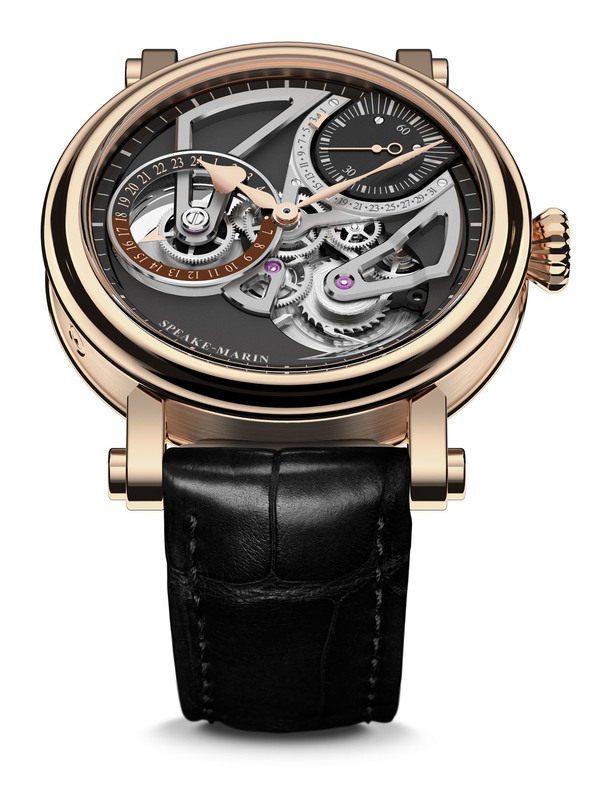 Price is set at CHF 38,700 for the pink gold 42 mm version. 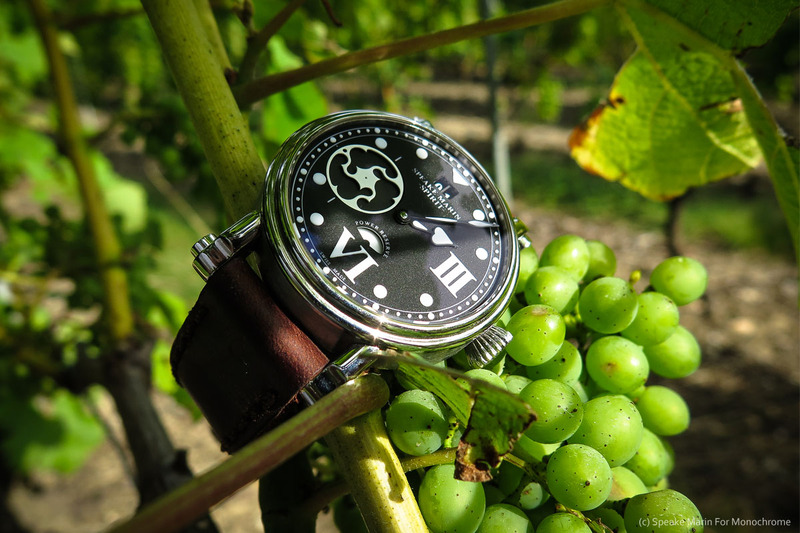 For more information, please visit www.speake-marin.com.